Lots of activity in the CSIT. 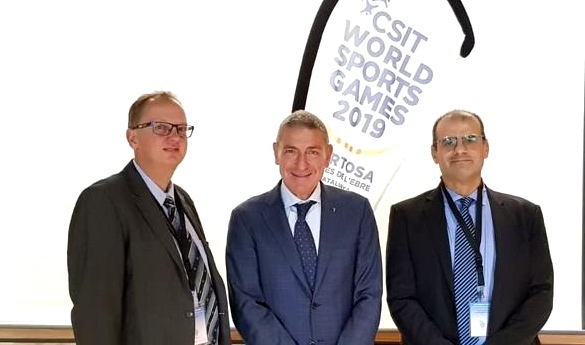 The Italian Claudia Borzacchini was elected as the new chairman of the Parasportkommission and presented her plans in CSIT and in particular for the WSG 2019 in Tortosa. Panathlon President Pierre Zabelli was a guest speaker at the congress, which presented the new Panathlon Award for CSIT members. European Fair Play Movement Vice President Katarina Raczova once again explained the successful Green Card initiative, since the WSG 2015 in Lignano, which will again be used at the WSG 2019 with its own fair play award. The Court of Arbitration has also been set up to deal with violations of CSIT values ​​and rules. The court is headed by the Italian lawyer and sports rights specialist Giancarlo Guarina from Rome, assited by Dr. Robert Kaspar, Professor for Sportmanagemant, Eventmanagement and Sportmarketing at the Private University Seeburg, Austria.